Traveling can be an absolute pain! Trying to find your way around, interpreting another language, worrying about your phone & how you are going to access the internet!! Stop worrying - we've got you completely covered with the new Ectaco English <-> Serbian iTRAVL 2 ! 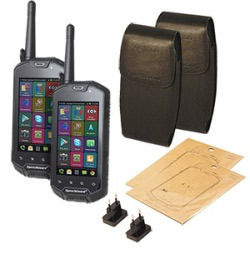 Easy to use and reliable; this rugged smartphone and voice translator will act as your own personal language assistant. A huge jump in travel technology, the iTRAVL 2 can receive FREE calls in over 160 countries, translate anything you say or see, and access tons of other useful travel tools. Everything is preloaded on your iTRAVL 2, no need to worry about difficult setups or downloads. Loaded with travel resources: The English <-> Serbian iTRAVL 2 will put tons of reviews, information and pictures right at your fingertips. Check customer reviews of that cool looking restaurant in Spain, read about the economy of Greece or even look up the climate in South Africa. The resources are almost endless so you can plan your trips accordingly. Learning a language has never been this easy or portable before now! Simply put, you can learn an ENTIRE LANGUAGE with the help of the Partner ESe900 or you can have it talk for you. Speech recognition and speech to speech translation modules will listen to your pronunciation of foreign words, phrases, and dialogues, giving you feedback along the way. More than 5 language games and programs will ensure learning is not only interactive but fun. Don't have time to learn? Well, then start communicating now! Voice activated phrases will allow you to interact with people in your target language without having to learn it. All 14,000 voice-activated phrases are spoken in a real human voice to facilitate understanding and includes a massive human-voice talking dictionary. A full electronic translator, physical keyboard and touchscreen make the Partner P900 not only sophisticated but also extremely easy to use. The greatest resource out there for letting people know exactly what you want, whenever you want it! Loaded with 14,000 pre-programmed phrases, just select a topic, say a phrase, and the device will find it for you instantly. You can even browse topics and choose what you want to say to have it pronounced fluently for you in English or Serbian. Traveling can be an absolute pain! Trying to find your way around, interpreting another language, worrying about your phone & how you are going to access the internet!! Stop worrying - we've got you completely covered with the new Ectaco English <-> Serbian SpeechGuard TLX! Easy to use and reliable; this rugged smartphone and voice translator will act as your own personal language assistant. A huge jump in travel technology, the SpeechGuard can receive FREE calls in over 135 countries, translate anything you say or see, and access tons of other useful travel tools. Everything is preloaded on your SpeechGuard TLX, no need to worry about difficult setups or downloads. Loaded with travel resources: The English <-> Serbian SpeechGuard will put tons of reviews, information and pictures right at your fingertips. Check customer reviews of that cool looking restaurant in Spain, read about the economy of Greece or even look up the climate in South Africa. The resources are almost endless so you can plan your trips accordingly. Our newest release, the ECTACO Audio PhraseBook B-3 English <-> Serbian B-3 , is an inexhaustible talking travel companion. It instantly translates 14,000 travel-oriented phrases divided by activity and speaks the translation aloud. Featuring natural pronunciation as recorded by native speakers it is easily understood by your listeners. And its powerful search functions allow you to quickly find what you need � exactly when you need it. So you will be communicating with ease in a matter of seconds! The B-3 comes complete with a stylish, self-amplified loudspeaker that you wear around your neck. It helps make sure you get your message across loud and clear. A bonus CD of more than 20 software dictionaries and the ECTACO Audio PhraseBook B-3 Desktop Manager is included to enhance your device. Furthermore, this remarkable translator is extremely customizable. It even allows you to add additional languages if needed.We have also included many practical organizer features to help you keep track of things. With an address book, diary, and digital voice memo, it is your own personal assistant. We have even included an music player to provide entertainment during your travels. Simply load it directly from your desktop PC before leaving home! Our newest release, the ECTACO Audio PhraseBook B-3 German <-> Serbian B-3 , is an inexhaustible talking travel companion. It instantly translates 14,000 travel-oriented phrases divided by activity and speaks the translation aloud. Featuring natural pronunciation as recorded by native speakers it is easily understood by your listeners. And its powerful search functions allow you to quickly find what you need � exactly when you need it. So you will be communicating with ease in a matter of seconds! The ECTACO Partner ESe800 is a revolutionary, expandable bilingual Dictionary and Travel Audio PhraseBook. With cool modern styling, hi-resolution color touch-display and state-of-the-art linguistic tools it is one of a kind. The massive vocabulary contains over 505,000 words and is one of the biggest around. The inclusion of the most sophisticated and accurate voice facilities available on today's competitive market is the defining feature of this remarkable handheld. It features both state-of-the-art English speech recognition and highly advanced English voice capabilities powered by the latest TTS (Text-to-Speech) technology. It even goes so far as to include crystal-clear native-speaker voices for both languages in the Audio Travel PhraseBook section as recorded by professionals. Designed with the real traveler in mind, the Audio PhraseBook is at your disposal on pleasure or business trips. It delivers real human-voice output in English and Serbian for over 14,000 pre-recorded phrases. It also provides the different responses you might receive in the "You May Hear" section. ECTACO Partner ESe800 is an English <-> Serbian translating device from the P800 series. Our newest release, the ECTACO Audio PhraseBook B-3 French <-> Serbian B-3 , is an inexhaustible talking travel companion. It instantly translates 14,000 travel-oriented phrases divided by activity and speaks the translation aloud. Featuring natural pronunciation as recorded by native speakers it is easily understood by your listeners. And its powerful search functions allow you to quickly find what you need � exactly when you need it. So you will be communicating with ease in a matter of seconds! The ECTACO Partner Dictionary and Travel Audio PhraseBook ESe800L is a powerful bilingual travel companion. One of the most impressive language management handhelds available anywhere, it is the clear leader in the field of portable translation devices. With its state-of-the-art voice capabilities and sleek modern design featuring a hi-res color touch-screen, it is our most popular model. This one-of-a-kind device includes a sophisticated speaker independent speech recognition system that lets it understand what is said to it in English and crystal-clear, professionally narrated native-speaker voice output for both English and Serbian in the PhraseBook. Providing frequent travelers and students alike with plenty of learning and communication options, this extraordinary Audio Travel PhraseBook also includes a massive bi-directional translating dictionary. With more than 505,000 entries, this extraordinary resource features a huge vocabulary and includes cutting edge English voice synthesis powered by the latest TTS (Text-to-Speech) technology among its collection of essential tools. Built to help users feel confident and relaxed when using a second language, the ESe800L is intelligent, flexible and quick to respond. This latest-generation handheld is full to capacity with valuable information and indispensable utilities that help you to make the most of your foreign language skills whether traveling, studying or conducting business. Expandable vocabulary: over 505,000 words included in the general dictionary. Any you can easily add more than 50 other language combinations that are available as ECTACO MMC Cards! Just type in English or Serbian using the bilingual keyboard and get a translation, definition, part of speech, gender, and many more grammatical references. If that's not enough, the Phrasebook function has 14000 phrases to list and select with a perfect translation for each. Word lists for help with the SATs are included with the Top 200 and 5000 most sophisticated words. Our newest release, the ECTACO Audio PhraseBook B-3 Russian <-> Serbian B-3 , is an inexhaustible talking travel companion. It instantly translates 14,000 travel-oriented phrases divided by activity and speaks the translation aloud. Featuring natural pronunciation as recorded by native speakers it is easily understood by your listeners. And its powerful search functions allow you to quickly find what you need � exactly when you need it. So you will be communicating with ease in a matter of seconds! The Ectaco Partner C-4 Electronic dictionary is a great resource whether you are learning a language or trying to communicate. The C-4 is the only translator in the world to employ an electronic book design. Opening the device reveals two screens and a full QWERTY keyboard which makes the features even easier to use. This design allows for enhanced translation and learning features all on an easy to use interface. The huge dictionary contains more than 477,500words for easy translation in either direction. Dictionary: Over 477,500 words pre-loaded in the dictionary with the option to add more than 50 language combinations available. It includes general and specific dictionaries with medical, law, economic and other specialized terms. The speaker button allows you to hear the pronunciation of any word instantly so you get your pronunciation correct. Audio Phrasebook: This feature delivers real human voice in English and Serbian for over 14,000 pre-recorded phrases. It also provides the different responses you might receive in the "You May Hear" section. Our newest release, the ECTACO Audio PhraseBook B-3 Spanish <-> Serbian B-3 , is an inexhaustible talking travel companion. It instantly translates 14,000 travel-oriented phrases divided by activity and speaks the translation aloud. Featuring natural pronunciation as recorded by native speakers it is easily understood by your listeners. And its powerful search functions allow you to quickly find what you need � exactly when you need it. So you will be communicating with ease in a matter of seconds!